Read Time: about 7 minutes. 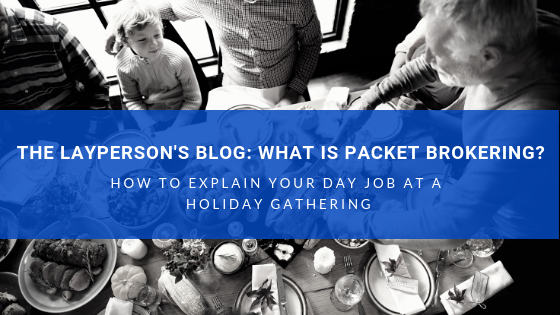 DL;DR: How to explain your technical day job to your non-technical family at a holiday dinner. We get it, your job is highly specialized. The cloud is deeply technical. Network visibility, packet brokering, application performance monitoring and cybersecurity quickly get into the deep weeds. Here is a handy holiday conversation guide you can use to impress your friends and relatives over your holiday dinner. So we’ve prepared a handy guide to make you the highlight of your next holiday dinner! This will help you through the conversations with your loved ones; and they’ll be amazed at how clever you are! You reply with, “I do technical work in cloud computing, Grandma. Let me explain..."
You’ve likely heard stories from the depression-era about folks who kept their money in their mattress instead of the bank. As confidence in the country’s banks evaporated in the late 1920s, people kept their cash at home; sometimes hidden in the mattress, sometimes in a big, old-timey combination safe. They did this to maintain both physical access and total control of what little money they had. With these “controls” in place, folks slept more soundly. A sense of accountability rested with each person who felt their money was more secure in their own homes. This is just like what we call “enterprise security”: companies keep their data and systems in their own buildings and their own computers. They have to keep these systems secure. Eventually, folks started to return to the banks. They set up savings accounts and deposit funds. They didn’t need to create more lumps in their mattresses (from stashing all that cash) or get bigger home safes to store their cash and valuables. They started using the banks, first to store their wealth and then to help with their transactions – checking, investments, business accounts, retirements accounts – you name it! At this point in the conversation, watch out for the uncle or cousin who works in finance. They’ll want some of grandma’s attention and will be quick to point out some detail you inevitably overlooked in your very clever analogy. Just smile and say, “hold that thought! We’ll come back to it…” then continue with your story. You’ve probably heard of cloud computing. If you listen to streaming music you’re using cloud computing. If you store or share your photos online, you’re using cloud computing. If you have ever bought something online, those companies run their systems in the cloud. Cloud computing is like the banks in my story. Today, banks allow us to access, transfer and withdraw cash from anywhere, at any time. We all enjoy the convenience of simple and easy access, but the banks work hard to keep all those transactions secure. That’s why we can each set up activity monitoring and fraud alerts to keep track of unusual banking activity – and you all should! Nowadays, our banks and credit cards require what’s called ‘two-factor authentication’ that goes along with personal identification numbers (PINs) and complex passwords. These provide additional proof and confidence to consumers that our money is secure and that payments are going where we intend them. Here’s where you wow them with your innovation. I’ve recently discovered Nubeva Prisms. This is a really neat solution I can use to see everything going on in my company’s cloud environment and send that data to my security tools. Before, I could only see some of the information, but now I can see everything, which means I can keep my company more secure in the cloud than ever before. You might be from one of those families where everyone understands or works in some technology-centric jobs. More and more people have heard of cloud computing and digital transformation. They have a small grasp on the huge, amorphous nature of the cloud itself because they store their own personal photos or digital music on the cloud or use cloud-based services in their own line of work. When you break the cloud down to smaller elements, it is correct that there is no difference between the type of equipment used in cloud data centers and in modern corporate data centers. At the “molecular” level, everything is the same. But with the cloud you no longer have any access to the physical components of your network. You can no longer point to the physical internet cables, or to the server that processes your email. Many elements of corporate security focus on the physical things; restricting access to certain areas, scanning network computers for malware or restricted data, or capturing, logging, and reviewing all internal and external communications. Let’s compare Enterprise Security and Cloud Security with fine dining. You see a similar contrast between award-winning restaurants like The French Laundry in California or The Fat Duck in the United Kingdom. At The Fat Duck, diners experience molecular gastronomy. At the molecular level, the ingredients are the same and the food is equally delicious. But the presentation and delivery of the meal is completely different. Same core ingredients, completely different delivery and experience. That is cloud security. Understanding the differences in data center and cloud security is very important. Your tech-savvy cousins, your business executive uncle and your adorable grandmother all have an important role to play. At Nubeva we focus on security solutions for your cloud. Nubeva is born in the cloud. This means everything about our solutions have been built with the cloud in mind. Every other solution in the cloud packet acquire-process-distribute space is antiquated enterprise security trying to make traditional data center solutions fit into the public cloud. Nubeva has, at our heart, the dynamic nature of the cloud. As new cloud workloads spin up, Nubeva ensures security and visibility policies are automatically followed. If cloud workload capacity starts to increase significantly, Nubeva ensures all solution components scale up to meet the new demand. As capacity decreases, Nubeva reduces its equivalent footprint to ensure that sizing is just right. Nubeva is the only born-in-the-cloud-solution for gaining deeper visibility into what is happening inside your cloud environment. It is one-fifth the cost and has three times the performance when compared to other offerings. When your IT team is tasked to find new technologies to improve cloud security, the simple answer is Nubeva. Want to learn more? Visit us at https://www.nubeva.com/.Now, you’re ready to move on to dessert! Happy Holidays from all of us here at Nubeva!